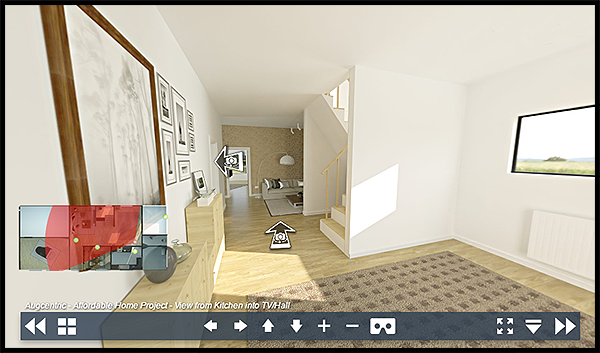 Our new 2D to 3D Virtual Tour product/service is now available. Previously, Augcentric have created apps for clients that have been downloadable from Google Play or the Apple Store. These have been great but really they don’t fully cover all devices, they are not cross-platform and are at times really large in size to download. So we looked at how to bring virtual tours to a bigger audience. Recent advances in technology and software, has allowed us to re-think our approach. Our new approach allows all devices to view a virtual walk-through. It’s easy to use and is VR ready including Oculus, Homido and GalaxyVR as well as Google Cardboard. Check out the demo below. Go fullscreen and follow the arrows! Click the VR Icon. Go into setup and make sure your device has been recognized. Change if necessary. Put your phone into your VR device. Samsung Galaxy VR users, do not connect the micro USB connector of the VR device to the phone. Just slip the phone in and let it rest on the back of the phone.